Its Friday, time to go to the Candy Shop (cue 50 cent). Corny? Yes! Accurate? Hell yes! This polish exudes every thing that song conveyed. Pink=Girls, Glitter= Party...unh huh "Girl Party" duh!!!! So this is the second of the 5 new Lippmann's I have (God I love birthdays), Candy Shop! Just like yesterday's Forget You, this polish is jam packed with glitter. Almost too jam packed (if that's humanly possible when speaking of glitter). 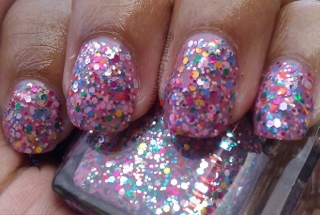 It contains the same multi colored round and hex glitter as Forget You and Happy Birthday in a nice pink base. I'm sure you could layer this but it builds nicely, as this is 2 coats in the pics below. Because of the glitter overload, it is a little thick so beware. How amazing is this polish! You can get this polish and other Deborah Lippmanns at Nordstroms or Nordstroms online. Hope everyone has a grat weekend! This polish is so cute! I love anything pink and glittery and this combines both.